Last August, as the lazy days of summer were coming to an end, we had no idea what lay ahead for the residents of Texas, Florida, and Puerto Rico. Seemingly overnight, everything changed. The most devastating, Hurricane Maria, hit Puerto Rico on September 16, 2017. More than 2,900 lives were lost3 and many residents were forced to relocate to the mainland. Estimated property damages range from $45 billion to $95 billion4 and more than 11,0005 residents are still without power. Since the rapid-fire hurricanes of 2017, we have witnessed the wildfires in California, the volcanic eruption in Hawaii, flooding throughout the United States and, most recently, in Kerala, India. Those of us who have largely escaped these devastating natural disasters find it difficult to even comprehend the impact when we see the faces of disaster. These recent events will have a long-lasting impact and similar events are likely on the horizon. We know our donors want to help and we encourage you to give strategically—that is, identify the causes that are important to you, evaluate the organizations you wish to support, then decide what type of relief is needed—and when. 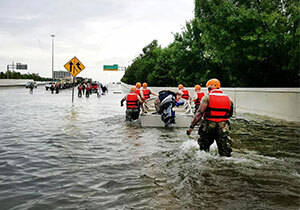 To facilitate contributions in response to the recent wildfires in California, the flooding in Kerala, India, and the most recent natural disaster in the southeastern United States, Hurricane Florence, Vanguard Charitable has partnered with Charity Navigator. Charity Navigator will compile lists of organizations supporting relief efforts and long-term infrastructure needs in these areas. These lists are not exhaustive, but are intended to help direct your charitable giving. In order to best assist relief efforts, Vanguard Charitable has expedited the granting process so that your grant can be put to use as quickly as possible. In addition to your financial support, which is needed for both short- and long-term needs, remember that you also have the opportunity to offer your time and talents to help these organizations, and others, in their ongoing work. Talk with representatives of the organizations and ask them what they need. Volunteer your time, offer your expertise. Your support is needed and your efforts will be rewarded many times over. Demotts, L. Joshua Master Sgt. 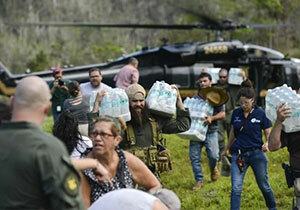 "U.S. Customs & Border Protection & FEMA personnel deliver food and water to isolated Puerto Rico residents after their bridge was destroyed by Hurricane Maria in the mountains around Utuado, Puerto Rico." FEMA, 30 Nov. 2017, https://www.fema.gov/news-release/2017/11/30/historic-2017-hurricane-season-comes-end-federal-support-recovery-continues.